The Kent & Essex IFCA district closely matches the county boundaries of Kent and Essex this has meant that as well as including the area previously regulated by Kent & Essex Sea Fisheries Committee, the K&EIFCA district also includes areas which were previously regulated by other agencies (Sussex Sea Fisheries Committee, Eastern Sea Fisheries Joint Committee, the Environment Agency Thames, South East, Anglian). Section 6 of The Marine and Coastal Access Act 2009 (Transitional and Saving Provisions) Order 2011, transfers the byelaws made by Sussex Sea Fisheries Committee (SSFC) and Eastern Sea Fisheries Joint Committee (ESJFC) and the Environment Agency sea fisheries byelaws to K&EIFCA for those parts of its district that were previously regulated by these bodies. This amalgamation practically changes little on the ground but does mean that there is a large amount of legislation that varies depending on your location in the district. K&EIFCA have made a commitment to review all of the legacy byelaws as a priority and sees the first step on this process as undertaking a strategic review of all its key fisheries (by undertaking a similar fisheries management assessment to that used by Sussex IFCA ‘Navigating the Future’). 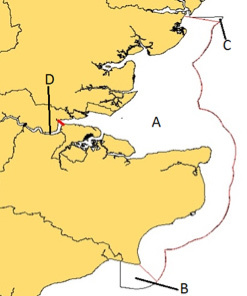 The byelaws relating to area A – Area A includes all the area previously covered by Kent & Essex Sea Fisheries District, from the old lighthouse in Dungeness, Kent to the northern boundary of Essex on the River Stour; extending into the Thames Estuary up to Mucking Creek and keeping the same seaward limit, as Kent & Essex IFCA. The byelaws relating to area B – This area was previously part of Sussex Sea Fisheries Committee district. Area B starts at the Kent County boundary line and finishes at the old lighthouse at Dungeness. The same seaward limit that was previously used by Sussex Sea Fisheries Committee is still keep by Kent & Essex IFCA. The byelaws relating to area C – Eastern Sea Fisheries Joint Committee previously regulated area C. The Southern boundary reflects the old Kent & Essex Sea Fisheries district boundary with the northern boundary now reflecting more closely the Essex county boundary.